San Francisco—Justice Maria P. Rivera, of the Court of Appeal, First Appellate District, Division Four (San Francisco), is the 2011 recipient of the Benjamin Aranda III Access to Justice Award, it was announced today. California Chief Justice Tani Cantil-Sakauye will present the award at a ceremony in December. The Judicial Council of California, State Bar of California, California Commission on Access to Justice, and California Judges Association cosponsor the award. Named for Judge Benjamin J. Aranda, the founding chair of the Judicial Council's Access and Fairness Advisory Committee, the Aranda Award honors a trial judge or an appellate justice whose activities demonstrate a long-term commitment to improving access to justice. "All of those who have had the opportunity to work with Justice Rivera know the passion and intensity she brings to this work, and the effectiveness with which she brings ideas to fulfillment," stated Court of Appeal Justice Laurie D. Zelon, last year's award recipient, in a joint statement with San Francisco attorney Richard W. Odgers, of Pillsbury Winthrop Shaw Pittman, LLP. 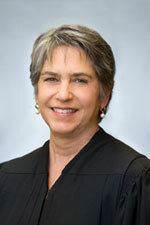 Justice James R. Lambden, of the First Appellate District, observed, "Throughout her careers as lawyer, Superior Court judge, and justice of the Court of Appeal, Maria Rivera has demonstrated relentless dedication to improving access to justice in furtherance of the goal of ‘justice for all'." Throughout her career, Justice Rivera has encouraged attorneys to serve as pro bono counsel for indigents, developed programs to help individuals who cannot obtain counsel to effectively represent themselves, and cooperated extensively with local bar associations to develop programs to provide representation to indigent individuals. Justice Rivera majored in Hispanic studies at Smith College, where she graduated in 1970. She attended law school at the University of San Francisco and spent summers working at San Francisco Neighborhood Legal Assistance Foundation—now part of Bay Area Legal Aid. After graduating from law school in 1974 and gaining admission to the bar, she entered private practice and one year later joined the Lawyer's Reference Panel Committee of the Bar Association of San Francisco. She also spent three years as a volunteer at the San Francisco Lawyers' Committee for Urban Affairs, handling cases for people who could not afford counsel but did not qualify for free legal aid. In 1978, Justice Rivera left private practice and served for three years as a deputy district attorney in San Francisco and later as an Assistant U.S. Attorney. She returned to private practice in 1981, and for the next 15 years—in addition to her private practice—worked tirelessly in the bar, the community, and her practice serving and assisting others to serve indigent clients. She was a member and officer of the Contra Costa County Bar Association, and was a founding member of the Women's Section of that association. She was a volunteer panel member for the Contra Costa Legal Services Foundation Ask-A-Lawyer program for many years. She also served eight years on the board of the Contra Costa County Legal Services Program. While serving on that board, she supported and promoted the mission of that program to provide free legal assistance to the county's low and moderate-income residents. In 1992, she also chaired the Pro Bono Panel of the Contra Costa County Bar Association, which provided representation for indigents. Justice Rivera was elected to the Superior Court of Contra Costa County in November 1996. While serving on the court, she worked to increase the involvement of volunteer lawyers in representing low and moderate-income residents of her county and established cooperative programs with the Contra Costa County Bar Association. In January 2002, Governor Gray Davis appointed Justice Rivera to the Court of Appeal for the First Appellate District, headquartered in San Francisco. During her tenure on the appellate court, her commitment to pro bono legal services and access issues has continued. She has served as an advisory member of the State Bar's Legal Services Trust Fund Commission since 1999 and currently chairs its Partnership Grants Committee. She has been a member of the Judicial Council's Advisory Committee on Access and Fairness since 2006, serving as co-chair of the Women of Color Subcommittee and as a member of the Racial and Ethnic Fairness and Access for Persons with Disabilities subcommittees. Justice Rivera also served on the Advisory Board of the Legal Services Coordinating Committee from 2003 to 2010. The committee, an umbrella organization embracing the Commission on Access to Justice, the Legal Services Trust Fund Commission, the Legal Aid Association of California, and the Judicial Council, is devoted to increasing funding for legal services, focusing on strengthening collaboration between courts and legal services providers. From 2007 to 2009, Justice Rivera was a member of the American Law Institute-American Bar Association (ALI-ABA) Critical Issues Summit Planning Committee to develop a set of recommendations pertaining to legal education. Justice Rivera was one of those committee members who proposed and advocated for the following recommendation: "Acknowledging our professional responsibility, the legal community should continue to develop programs that will prepare and encourage law students and all lawyers to serve the underserved." Justice Rivera has supported diversification of the bench as a means to improve public confidence in the courts. She chaired a joint committee of the Judicial Council and State Bar that developed the Judicial Diversity Toolkit to help courts become active in encouraging women, persons of color, persons with disabilities, and other diverse lawyers to consider judicial careers. She also is a mentor with the Judicial Mentorship programs for the Bar Association of San Francisco, the Alameda County Bar Association, and the Diversity Section of the Contra Costa Bar Association. Her contributions in these areas have been informed and strengthened by her work on the national stage as a member from 2005 to 2008 of the ABA Commission on Racial and Ethnic Diversity in the Profession, designed to increase minority participation, retention and success in the legal profession. In addition to her work on these state and national committees, Justice Rivera has been a longtime member of the California Judges Association and the National Association of Women Judges. Her other affiliations include the California Latino Judges Association and the Judicial Section of the Hispanic National Bar Association. She has served on the Board of Governors of University of San Francisco Law School and the Board of Trustees of the University of San Francisco. Justice Rivera serves on two Supreme Court committees—Judicial Ethics Opinions and Applicant Evaluation and Nomination Committee for State Bar Court Judges. Justice Rivera was recognized by the Contra Costa County Bar Association as the 1999 Pro Bono Judge of the Year, in recognition of her work to promote Contra Costa County's volunteer legal services program. In 2001 she was named Trial Judge of the Year by the Alameda-Contra Costa Trial Lawyers Association. In 2002, the San Francisco La Raza Lawyers Association presented her with the Distinguished Justice Award for outstanding leadership in the community.